This new chair was launched in October 2012 at the Marion Lauder Home. Paula Clark one of the proprietors at the care home had suggested to us she would like a chair with a waterproof fixed cushion. So after listening to our customer we have now developed a chair that we believe is unique, the cushion is built into the chair, the chair is practical, cost saving, no more misplaced cushions and the chair never looks untidy. The chair is available in a vast range of colours. Fabric or real leather variants are also available. 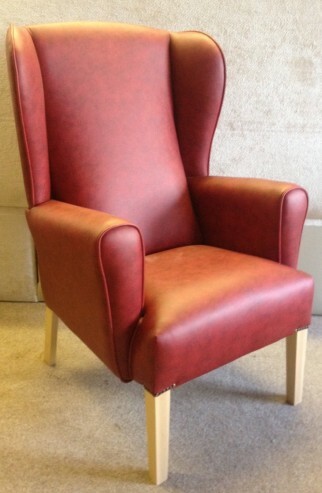 THIS CHAIR IS BESPOKE & MADE IN LANCASHIRE – you can even specify seat widths.